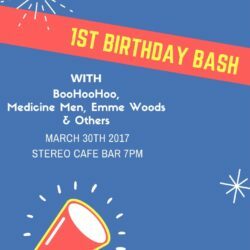 Help Celebrate our 1st Birthday with an exclusive concert at Stereo Cafe Bar – Renfield Lane Glasgow on Thursday 30th March 2017. Performances from LNFG Acts Old & New including BooHooHoo, Medicine Men, Emme Woods and Others. Free Entry for all 2017/2018 LNFG Members. Tickets available for non-members at our store for £10.